chris heintz on the field! My baseball obsession has kind of taken a backseat this summer, mainly because of the other stuff I have going on, but it doesn’t mean I don’t appreciate a good scruffy-faced injured-catcher from time to time. 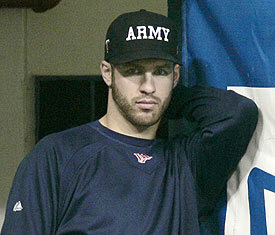 Big Joe Mauer, you should lose the razor every once in a while. I’m just sayin’. I’m a little scared the Twins might find themselves short on catchers, if they’re not careful. One of the Douche Sox pitchers clocked Mike Redmond with a pitch last night, rendering him unable to run the bases. When I saw Chris Heintz trembling with nerves as he took off his catcher equipment, I had to run outside of Tony Jaro’s and let Bill and Matt know what was going on. Chris Heintz! You’re a ball player, son! and, while heintz was kind of awesome today, i cannot wait for mauer’s return. especially if he brings the winning-streak beard with him.